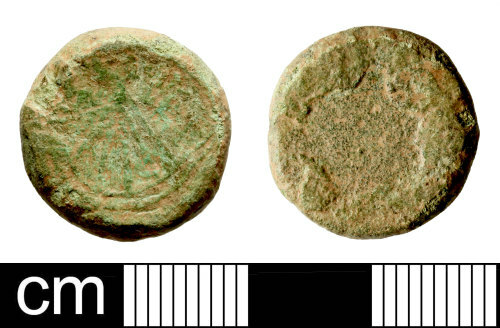 A Medieval to Post-Medieval copper alloy coin weight probably dating to c. AD 1400-1600. The weight is uniface, sub-circular in plan and rectangular in cross-section. The front depicts a ship with single mast, with further detail lost to abrasion, the reverse is plain. Dimensions: diameter 17.2mm; thickness 4.0mm; weight 5.75g. Withers & Withers (1995: 19) publish a similar example, with mast flanked by a lis and lion, which they suggest was a weight for the gold noble.